S. K. Jason Chang, Chi-Hsuan Wu and Chih-Hsu Lin, “Optimal Fleet Size of GPS Taxi in a Cruising Taxi Market”, Journal of Transport Information and Safety，Vol. 29 No.1, P.46-P.50, February 2011. Chang, S.C., S. K. Jason Chang, Chang, J.T., Lee, C.C., “The Planning and Development of Real Time Traffic Information Collect and Control System Engineering in Taiwan Provincial Highway,” Taiwan Highway Engineering, P.2-P.17, November 2009. S. K. Jason Chang, “The Significance of Feeder Systems of High Speed Railways,” Urban Mass Transit (China), Vol. 12, No. 8, pp.i-i, August 2009. S. K. Jason Chang, Wu, C.H. and Lin, C.H., “Innovative Web Taxi Service,” Journal of CECI Engineering Technology, Vol. 83, P.80-P.89, July 2009. S. K. Jason Chang, Wu, C.H., Wang, G.Y. and Lee, H.Y., “Web Taxi–Interactive Web Taxi Dispatch Service,” Invited Paper on Special Issue of ITS, The Magazine of The Chinese Institute of Civil and Hydraulic Engineering, Vol. 35, No. 6, P.83-P.93, December 2008. S. K. Jason Chang, Wu, C.H, and Tsai, C.H., “Development Strategies of Transit Metropolis,” City Development, Vol. 5, P.10-P.39, June, 2008. S. K. Jason Chang, Wu,C.H. “Retrospect and Prospect of Public Transportation Month and Car Free Day Activities in Taipei,” Journal of Urban Transport of China, 5(4), July 2007, P.12-P.20. Hsiao, W.C. and S. K. Jason Chang, “Introduction of Segment-based Traffic Information Estimation Method Using Cellular Network Data”, Journal of the Eastern Asia Society for Transportation Studies, Vol. 6, Sept 2005, P.1610-P.1623. S. K. Jason Chang, et al, “An Assessment of Service Quality and Criteria for Mass Rapid Transit System,” Urban Transportation, September 2005. S. K. Jason Chang and Guo, Y.J., “Trip Costs Analysis of Bus Rapid Transit,” Journal of the Eastern Asia Society for Transportation studies, September, 2005. S. K. Jason Chang and Chu, T.S., “Optimal Headway and Route Length for a Public Transit System under the Consideration of Externality,” Journal of the Eastern Asia Society for Transportation studies, Vol.6, P.4001-P.4006, September, 2005. Chang, S. K., Chen, Y. W., and Chen, Y. L., "Multi-Directional Dispatch Platform: Cloud Taxi," the 20th ITS World Congress, Tokyo, 14-18 October 2013 (Technical paper). S. K. Jason Chang, et al., Planning of Demand Responsive Transit System in Tao-Yuan, Proceedings of the 26th Annual Meeting of Chinese Institute of Transportation, December, 2011. S. K. Jason Chang and Che-Cheng Lin, “Benefit Analysis of Upgrading Exclusive Bus Lane to Bus Rapid Transit”, Proceedings of the 26th Annual Meeting of Chinese Institute of Transportation, December, 2011. S. K. Jason Chang, “Smart Travel and Sustainable Mobility”, Invited Paper and presentation in the 16th China Modernization Forum, Beijing, China, August 15-16, 2011. S. K. Jason Chang and Che-Hsien Liao, “Identification of The Gap for GPS-Based Dispatching Taxi Service Chain”, Proceedings of the 11th Cross Strait ITS Conference, Wuhan, China, July, 2011. S. K. Jason Chang, Chi-Hsuan Wu and Chih-Hsu Lin, “Optimization of Fleet Size for GPS Taxi”, Proceedings of the 11th Intelligent Transport Systems Asia-Pacific Forum & Exhibition, Kaohsiung, Taiwan, June 8-10, 2011. S. K. Jason Chang, Te Shao Chen, Jia Lu Liao, Rui Liang Gau, Chin Chieh Huang, “Function Planning and System Development of Demand Responsive Transit Services”, Proceedings of the 11th Intelligent Transport Systems Asia-Pacific Forum & Exhibition, Kaohsiung, Taiwan, June 8-10, 2011. S. K. Jason Chang et al., “Service Design of Taoyuan Demand Responsive Transit System,” Proceedings of the 25th Annual Meeting of Chinese Institute of Transportation, December 2010. S. K. Jason Chang and Wu, P.J., “Operational Behaviors of GPS-Taxi Driver,” Proceedings of the 25th Annual Meeting of Chinese Institute of Transportation, December 2010. S. K. Jason Chang, Chi-Hsuan Wu and Chih-Hsu Lin, “Optimal Fleet Size of GPS Taxi in a Cruising Taxi Market”, Proceedings of the 10th Cross Strait ITS Conference, Chongqing, China, October 2010. S. K. Jason Chang, Chi-Hsuan Wu, Kuan-Yao Wang and Chih-Hsu Lin, “Comparison of Environmental Benefits between Satellite Scheduled Dispatching and Cruising Taxi Services”, Paper presented in the 89th Annual Meeting of the Transportation Research Board, Washington, D.C., January 2010. S. K. Jason Chang, Wu, C.H., Lu, Y.C. and Chang, P.Y. (2010), “Cloud Computing Application for Taxi Dispatching Service,” the 23rd ICTPA Annual Meeting & The 8th Asia Pacific Transportation Development Conference, Tainan, Taiwan, May 27-30, 2010. S. K. Jason Chang, Wu, C. H., Wang K. Y. and Lin, C. H., “Comparison of Environmental Benefits between Satellites Scheduled Dispatching and Cruising Taxi Services.” Transportation Research Board 89th Annual Meeting, January 10-14, 2010. S. K. Jason Chang, Lin, K.S., Lu, Y.C. and Li, Y.K., “Evaluation Mechanism of Sustainability for MRT Development,” Proceedings of the 24th Annual Meeting of Chinese Institute of Transportation, December 2009. S. K. Jason Chang, Li, Y.K. and Wang, T.Y., “Improvement Strategies Analysis for Tourist Coach Market,” Proceedings of the 24th Annual Meeting of Chinese Institute of Transportation, December 2009. Chang, P.Y., Li, Y.K. and S. K. Jason Chang, “Alternatives Analysis of Taipei Metro Future Routes,” Proceedings of the 24th Annual Meeting of Chinese Institute of Transportation, December 2009. S. K. Jason Chang, “Public Private Partnership Approach for Smart Card Ticketing System,” Invited presentation on the 2nd Urban Mobility India Conference, December 4, 2009. S. K. Jason Chang, “Comprehensive Planning for Better Mobility,” Keynote Address in the 2nd Urban Mobility India Conference, Invited by Institute of Urban Transport and India Ministry of Urban Development, December 3, 2009. S. K. Jason Chang, “e-Bus System Development in Taiwan,” Invited presentation in the 2009 ITS Conference of India Association of ITS, December 2, 2009. S. K. Jason Chang, “Integration of Land Use and Transportation Planning,” Invited Lecture in the Transport Demand Management, GTZ and India Ministry of Urban Development, Delhi, December 2, 2009. Chang, S.C., S. K. Jason Chang, Chang, J.T., Lee, C.C., “The Planning and Development of Real Time Traffic Information Collect and Control System Engineering in Taiwan Provincial Highway under the ITS Issue,” Proceedings of the Annual Conference on Traffic Safety and Enforcement, pp. 379-394, September 2009. Chang, S. K., Wu, C.H , Wang, K.Y., and Lin, C.H., “Environmental Benefits of GIS/GPS-Based Scheduled Taxis,” The 10th ITS Asia Pacific Forum, July 2009. Chang, S. K., Chieh, C.H, Lu, Y.C., Wu, C.H, and Chung, C.Y., “Development Strategies of Telematics Technologies and Intelligent Transportation Systems based on Sustainability,” The 9th Cross Strait ITS Conference, Taichung, May, 2009. Chang, S. K., Wu, C.H, and Wang, K.Y., “Application of Innovative Web Taxi Dispatching Service,” The 9th Cross Strait ITS Conference, Taichung, May, 2009. S. K. Jason Chang and Lu, Y.C., “Assessment on ITS Technologies for Bus Rapid Transit,” Transportation Research Board 88th Annual Meeting, January 11-15, 2009. S. K. Jason Chang and Chu, C.H., “Welfare-Maximized Vacancy and Subsidy Rates with Maximum Social Willingness-to-Pay under Log-linear Demand for a Cruising Taxi Market,” Transportation Research Board 88th Annual Meeting, January 11-15, 2009. S. K. Jason Chang and Tsai, T.Y., “Optimal Area and Toll for Congestion Pricing,” Proceedings of the 23th Annual Meeting of Chinese Institute of Transportation, December 2008. S. K. Jason Chang, Wu, C.H, and Chen, Y.S., “Analysis of Critical Improvement Factors in Taxi Industrial Policies,” Proceedings of the 23th Annual Meeting of Chinese Institute of Transportation, December 2008. S. K. Jason Chang and Liao, Y.C., “Evaluation on Strategies and Benefits of Applying Smart Card Ticketing System for Taiwan Railways Administration,” Proceedings of the 23th Annual Meeting of Chinese Institute of Transportation, December 2008. S. K. Jason Chang and Chuang, P.C., “Traffic Engineering Design and the Strategy of Enforcement for ETC System,” Proceedings 15th ITS World Congress, New York, Nov 16~20, 2008. S. K. Jason Chang and Lu, Y.C., “Assessment on ITS Technologies for Bus Rapid Transit,” Proceedings 15th ITS World Congress, New York, Nov 16~20, 2008. S. K. Jason Chang, “Status of Cycling in Taiwan,” Invited Speech in the Cycling Forum, organized by Interface for Cycling Expert and India Institute of Technology, April 7~8, 2008. S. K. Jason Chang, Congestion Charging and Smart Mobility, Invited Panel Speech on Session: Regional Vehicle Control and Congestion Charging, International Seminar on Environment and Transportation Management, Feb 26~28, 2008. S. K. Jason Chang, “Financial Sustainability of Urban Rail Systems,” Invited Panel Speech in 2008 Rail Forum, organized by Chinese Institute of Transportation and National Cheng-Kung University, January 25, 2008. S. K. Jason Chang, “Intelligent Transportation Technologies for Sustainability,” Invited Speech in the Annual Meeting of Chinese Institute of Transportation, December 2007. S. K. Jason Chang, Liu, Y.L and Wu, C.H., “Performance Evaluation of the Intelligent Taxi Companies and the Dispatching Centers,” Proceedings of the 22nd Annual Meeting of Chinese Institute of Transportation, December 2007. S. K. Jason Chang and Guo, Y.J., Full Cost Analysis on Park and Ride Strategy,” Proceedings of the 22nd Annual Meeting of Chinese Institute of Transportation, December 2007. S. K. Jason Chang, Wu, C.H., and Chen, Y.L., “Performance Evaluation of e-Taxi Operation,” Proceedings of the 22nd Annual Meeting of Chinese Institute of Transportation, December 2007. S. K. Jason Chang and Suen, J.C.S, “Simulation Model of Sub-Stop Bus Rapid Transit System,” Proceedings of the 22nd Annual Meeting of Chinese Institute of Transportation, December 2007. S. K. Jason Chang and Chen, G.H., ”Assessment of Financial Sustainability of Urban Public Transportation Systems,” Proceedings of the 22nd Annual Meeting of Chinese Institute of Transportation, December 2007. S. K. Jason Chang, “Challenges of Sustainable Transportation Development,” Invited presentation in the Annual Meeting of Taipei Society of Transportation Safety, November 2007. Chang, S. K., “Bus rapid transit system: planning, design, and management,” Invited speech in the Sustainable Urban Transportation Systems, sponsored by GTZ Germany, Nov 14~18, 2007. S. K. Jason Chang and Guo, Y.J., “Full Cost Analysis on Park and Ride Strategy,” the 2007 Cross Strait Urban Transportation Conference, FuZhou China, Oct 26~28, 2007. Chang, S. K., “Urban Development and Transportation Planning,” Invited speech on the 2007 Cross Strait Urban Transportation Conference, FuZhou China, Oct 26~28, 2007. S. K. Jason Chang, “Interoperability and Integration: Lessons and Challenges,” Invited Speech in the 2nd Asia Pacific Discussion Forum on Transport Revenue Collection, Co-sponsored by the Asia Pacific Smart Card Association and Institute of Transportation, Taipei, Oct 25~26, 2007. S. K. Jason Chang, and Lu, Y.C “Integration of Intelligent Transportation Technologies into Bus Rapid Transit,” Proceedings 14th ITS World Congress, Beijing, Oct 9~13, 2007. S. K. Jason Chang, “ITS Development in Taiwan,” Invited Speech in Special Session on Asia ITS Development, 2007 ITS World Congress, Beijing, Oct 9~13, 2007. S. K. Jason Chang, “One Card for One Day Community,” Invited Speech in the 2007 Forum on Smart Card for Ticketing and e-Payment Services, Sponsored by the Asia Pacific Smrrt Card Association, Taipei, June 21, 2007. S. K. Jason Chang, “Public Transportation Month and Car Free Day Activities in Taipei,” Training for the Chinese Urban Public Transportation Week and Car Free Day Activities, , Beijing, Co-sponsored by Ministry of the Construction of PRC, Co-organizers: China Academy of Urban Planning & Design, the Energy Foundation, the World Bank, China Sustainable Transportation Center, and GTZ, April 19~20, 2007. S. K. Jason Chang, “Intelligent Design of Transportation Infrastructures for Sustainability,” Invited Speech in the 4th Annual Meeting of Asia Civil Engineering Association, April 2007. S. K. Jason Chang and Chen, W.L, “Effects of Ticketing Technology on BRT Design and Operation,” Proceedings of the 21th Annual Meeting of Chinese Institute of Transportation, Hsinchu, Taiwan, December 15, 2006. S. K. Jason Chang, Lin, C.H. and Lu, Y.C “Integration of Intelligent Transportation Technologies into Bus Rapid Transit,” Proceedings of the 21th Annual Meeting of Chinese Institute of Transportation, Hsinchu, Taiwan, December 15, 2006. S. K. Jason Chang and Suen, J.C.S, “Simulation Model of Sub-Stop Bus Rapid Transit System,” Proceedings of the 21th Annual Meeting of Chinese Institute of Transportation, Hsinchu, Taiwan, December 15, 2006. S. K. Jason Chang, Guo, Y.J. and Chang, K.T., “Trip External Costs in Urban Area,” Proceedings of the 21th Annual Meeting of Chinese Institute of Transportation, Hsinchu, Taiwan, December 15, 2006. Jiang, Y., Zhang, Y, S. K. Jason Chang, et al., “Review and Prospect of VPS-based Electronic Toll Collection System,” Proceedings of the Urban Transportation Forum and the 20th Annual Conference of Transportation System Engineering Committee of China System Engineering Society, Beijing, China, Dec 2~3, 2006. S. K. Jason Chang, “ITS Development in Taiwan,” Invited Speech in Urban Transportation Forum and the 20th Annual Conference of Transportation System Engineering Committee of China System Engineering Society, Beijing, China, Dec 2~3, 2006. S. K. Jason Chang and Li, Y.K., “An Analysis of Delay in Bus Rapid Transit System,” Proceedings of the 14th Cross-Strait Urban Development Conference, Hsinchu, Taiwan, November 25~26, 2006. S. K. Jason Chang and Guo, Y.J., “Advantages and Benefits of Bus Rapid Transit Oriented Development,” Invited Speech and Paper in Proceedings of the 13th Cross-Strait Urban Development Conference, Hsinchu, Taiwan, November 14~15, 2006. S. K. Jason Chang and Wu, C.H., “Reliability of Bus Dynamic Information System,” Proceedings of the 3rd Tongzhou Forum on Transportation, Shanghai, China, October 29, 2006. S. K. Jason Chang and Lu, Y.C., “Application of Expert System for Integration of ITS Technologies in BRT,” Proceedings of the 3rd Tongzhou Forum on Transportation, Shanghai, China, October 29~30, 2006. S. K. Jason Chang, BRT and Urban Development: BRT in Asian Cities, Invited Speech in the 3rd Tongzhou Forum on Transportation, Shanghai, China, October 29~30, 2006. S. K. Jason Chang, ITS: Intelligent Transportation Sustainability, Invited Speech in the Executive Session of Intelligent Infrastructure Design, 2006 ITS World Congress, London, United Kingdom, October 9, 2006. S. K. Jason Chang, Chun, B.C. and Hwang, C.R., “Traffic Safety Characteristics and Accident Types of Electronic Toll Collection System,” Proceedings of National Conference on Traffic Safety and Enforcement, Sept 28, 2006. S. K. Jason Chang, Bus Rapid Transit and Lessons from Taipei, Invited Keynote Speech in Seminar on Bus Rapid Transit Development in Indian Cities, organized by United Nations Development Programme and India Ministry of Urban Development, Jaipur, India, September 4~5, 2006. S. K. Jason Chang and Lu, Y.C., "Review of Electronic Payment Systems by Public Private Partnership Approach,” Proceedings of the Cross Strait ITS Conference, Hsinchu, Taiwan, August 2006. S. K. Jason Chang, Lu, Y.C., and Lin, C.H., “Evaluation of ITS Technologies for Bus Rapid Transit”, Proceedings of 8th Asia-Pacific ITS Forum, Hong Kong, July 10~12, 2006. 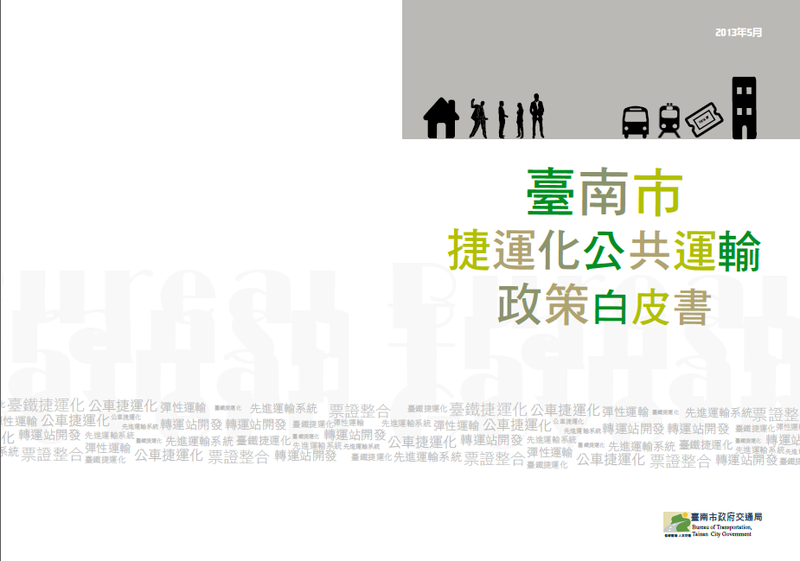 S. K. Jason Chang and Guo, Y.J., “Bus Rapid Transit Oriented Development for Healthy Community,” Invited presentation and Paper in Proceedings of Greenhouse Gas Reduction Conference, Taiwan, February, 2006. S. K. Jason Chang, Advanced Public Transportation Development in Taiwan, Invited Presentation in Executive Session of Public Transportation, 2005 ITS World Congress, San Francisco, U.S.A., November 7~10, 2005. S. K. Jason Chang, ITS Development in Taiwan: Review and Prospect, Invited Presentation in Special Session on ITS Emerging Market, 2005 ITS World Congress, San Francisco, U.S.A., Nov 7~10, 2005. S. K. Jason Chang, Progress of BRT Systems, Invited Keynote Presentation in the International Forum on Bus Rapid Transit, the Energy Foundation, Beijing, Oct 20, 2005. S. K. Jason Chang, Bus Rapid Transit Systems: International Experience, Invited Presentation, Technical Seminar, Transportation Planning Center, Shenzhen China, Sept 2005. S. K. Jason Chang, Smart Card Ticketing System in Taipei, Invited Presentation in the 2005 ITS Asia Pacific Forum, New Delhi, India, Aug 2005. S. K. Jason Chang, Lu, Y.C., Lin, C.H. and Wu, P.C., "Evaluation of ITS Technologies for Bus Rapid Transit Systems,” Proceedings of the 2005 Cross Strait ITS Conference, Shanghai, August 2005. S. K. Jason Chang and Guo, Y.J., “Assessment of Trip Cost for Transit-oriented Development Model,” Proceedings of the 13th Cross-Strait Urban Transportation Conference, China, August 2005. S. K. Jason Chang, Suen, James C.S. and Hsieh, H.S., " Research and Development of PC-Based Signal System – An Illustration of TRTC,” Proceedings of the 16th Annual Meeting of Rail Engineering Society of Taiwan, Taipei, May 2005. S. K. Jason Chang et al., Planning and Demonstration of Demand Responsive Transit System (Ⅲ/Ⅲ), Technical Report, Joint Research Project of ITS Taiwan and Institute of Transportation MOTC, Dec 2011. S. K. Jason Chang, Planning and Promoting International Involvement of ITS/Telematics Industry, Technical Report, Telematics Promotion Office, Institute for Information Industry, Dec. 2011. Chen, G., Chen, W., Feng, C.M., and S. K. Jason Chang et al., Development of Transportation Systems in Asian Countries and Mainland China (I/Ⅲ), Technical Report, National Policy Foundation, Dec. 2011. S. K. Jason Chang et al., Assessment on Impact of Mega Transportation Infrastructures on National Welfare and Regional Development, Technical Report, Institute of Transportation MOTC, November 2011. S. K. Jason Chang et al., Knowledge and Value Chain Reconstruction of Taxi Industry - Innovational Application and Promotion of Industry-Academic Cooperation (I/Ⅲ), Technical Report (Grant: NSC99-2627-E002-004), National Research Council, Jul 2011. S. K. Jason Chang, Planning and Promotion of International Involvement of ITS/Telematics Industry, Technical Report, Telematics Promotion Office, Institute for Information Industry, Dec. 2010. S. K. Jason Chang et al., Evaluation on Service Quality and Safety of Freeway Bus Systems, Technical Report prepared for Directorate General of Highways, MOTC, 2010. S. K. Jason Chang et al., Planning and Demonstration of Demand Responsive Transit System (Ⅱ/Ⅲ), Technical Report, Joint Research Project of ITS Taiwan and Institute of Transportation MOTC, Dec 2010. Lai, Y.H., S. K. Jason Chang, Hong, J.J. and Wu, C.H., The Integration Mechanism of Public Transportation Systems in Northern Taiwan, Technical Report, Taoyuan County Government, Aug 2010. S. K. Jason Chang, Regulation Policy and Innovative Service in Taxi Industry (III), Technical Report (Grant: NSC98-2221-E002-124), National Research Council, July 2010. S. K. Jason Chang et al., The Demand Responsive Transit System Development Plan in Taoyuan County, Technical Report, Taoyuan County Government, Dec 2009. S. K. Jason Chang, 2009 Evaluation Service Quality of Freeway Bus, Technical Report, Directorate General of Highways, MOTC, Dec 2009. S. K. Jason Chang, Research of Developing Civil Traffic Information Collection and Sharing Strategy, Technical Report, Institute for Information Industry, Dec 2009. S. K. Jason Chang et al., Integrated Research on Demand Responsive Transit System, Technical Report, MOTC, Nov 2009. S. K. Jason Chang, Enhancement Policy and Innovative Service in Taxi Industry (II), Technical Report (NSC96-2221-E002-185), National Research Council, Jul 2009. S. K. Jason Chang et al., Research of Sustainable Development on Construction and Operation of Mass Rapid Transit System, Technical Report, MOTC, Apr 2009. S. K. Jason Chang, Research of Intelligent Transport and Telematics Application, Technical Report, Institute for Information Industry, Dec 2008. S. K. Jason Chang, Role and Policy of Taxi as the Public Transportation System in Taipei City, Technical Report, Research Development and Evaluation Commission (RDEC), Taipei City Government, Dec 2008. S. K. Jason Chang, Application of Telematics Technology and Intelligent Transportation Systems, Technical Report, submitted to the Institute for Information Industry, Dec 2008. S. K. Jason Chang, Wei, C.H., Lin, D.C. and Hong, J.J, 2007 Evaluation of Safety and Service Quality of Tourist Bus, Technical Report, Directorate General of Highways, MOTC, Nov 2008. S. K. Jason Chang, The Survey of Taxi Operation in Taipei Metropolitan Area in 2008, Technical Report, Department of Transportation of Taipei City and Taipei County, Oct 2008. S. K. Jason Chang, Taxi Regulation Policy and Industry Innovative Service, Technical Report (NSC96-2221-E-002-179), National Research Council, Oct 2008. S. K. Jason Chang, Enhancement Policy and Innovative Service in Taxi Industry, Technical Report (NSC96-2221-E002-178), National Research Council, Oct 2008. S. K. Jason Chang, Review and Prospect of Chiayi BRT System, Technical Report, Bureau of High Speed Rail, MOTC, July 2008. S. K. Jason Chang, Chang, H.W. and Lee, Y.K., "The Status of Cycling in Taiwan", Report prepared for the ‘Position paper on cycling in Asia’ project coordinated by the Interface for Cycling Expertise (I-CE) and the Transportation Research and Injury Prevention (TRIPP), IIT, Delhi under the aegis of the Bicycle Partnership Program of I-CE and the Sustainable Urban Mobility in Asia (SUMA) project led by Clean Air Initiative (CAI), Asia. S. K. Jason Chang et al., Planning and Design Guidelines for Taxi Waiting Area in Intermodal Station, Technical Report, Dept of Civil Engineering, National Taiwan University, April 2008. S. K. Jason Chang, A Preliminary Design of Web-based Dispatching System for Service Vehicles, Technical Report, National Taiwan University. S. K. Jason Chang, Integration of Wireless Communication Network and Arrive Time Prediction Model for Bus Rapid Transit System, Technical Report (NSC 95-2221-E-002-391), National Research Council, Oct 2007. S. K. Jason Chang and Guo, Y.J., Full Cost of Transfer Modes for Urban Rail, Technical Report, National Taiwan University, May 2007. S. K. Jason Chang, Sustainable Finance Schemes for Bus Transit System, Technical Report submitted for Taipei Bus Union, April 2007. S. K. Jason Chang and Lee, Y.K., Transportation Demand Management Strategies for Developing Cities, Technical Report, National Taiwan University, Dec. 2006. S. K. Jason Chang et al., Management Strategy of Intelligent Taxi System, Technical Report prepared for Taiwan Taxi Corporation, by Tjing Ling Industrial Research Institute, National Taiwan University, Nov 2006. S. K. Jason Chang et al., Assessment of ITS Technologies for Bus Rapid Transit Systems (II), Technical Report (NSC 94-2211-E-002-016) , National Research Council, Oct 2006. S. K. Jason Chang and Chu, C.H., Optimal Vacancy Rate and Fare for A Cruising Taxi Market with a Budget Constraint, Technical Report, Dept of Civil Engineering, National Taiwan, University, March 2006. S. K. Jason Chang and Guo, Y.J., Trip Full Cost in Urban Area, Technical Report, National Taiwan University, Feb 2006. S. K. Jason Chang and Guo, Y.J., Comparison of BRT and LRT Options for Kaohsiung Metropolitan, Technical Report, Dept of Civil Engineering, National Taiwan University, December 2005. S. K. Jason Chang and Chu, C.H., Welfare-Maximized Vacancy and Subsidy Rates with the Maximum Social Willingness-to-Pay for a Cruising Taxi Market, Technical Report, Dept of Civil Engineering, National Taiwan University, December 2005. S. K. Jason Chang et al., Assessment of ITS Technologies for Bus Rapid Transit Systems (I), Technical Report (NSC 93-2211-E-002-051), National Research Council, Sept 2005. S. K. Jason Chang, The Development of Intelligent Transportation in Taiwan, Invited Speech in Australian ITS Summit, Australian Technology Park, Sydney, Australia, Sep 18-31, 2013. S. K. Jason Chang, Cloud Taxi, Invited Speech in the Eco Mobility World Festival, Suwon, Korea, Aug 31, 2013. S. K. Jason Chang, 1-TDM Strategies and Challenges in Development Cities, Invited Speech in the 6th International Symposium on Travel Demand Management, Dalian, China, Aug 21-23, 2013. S. K. Jason Chang, Achieving Sustainable Development by the Application of Intelligent Transportation, Invited Speech in the 12th ITS Conference Across the Taiwan Straits, Chengdu, China, Aug 15, 2013. S. K. Jason Chang, Light Rail and Sustainable Urban Transport, Invited Speech in the Global Environment Facility, Suzhou, China, May 9-10, 2013. S. K. Jason Chang, Motorcycle Management Policy in Taiwan, Invited Speech in the 10th Transforming Transportation Annual Conference, the World Bank, Washington, D.C., Jan 17-18, 2013. S. K. Jason Chang, High-Speed Rail in Asia: The Taiwan Experience, Invited Speech in the High Speed Rail and Sustainability Symposium, UC Berkeley, United States, Nov 29, 2012. S. K. Jason Chang, Missing Links for Eco Mobility and Green Transport Cities, Invited Speech in the Eco Mobility Workshop, ICLEI Eco Mobility Alliance, Changwon, Korea, Nov 19-20, 2012. S. K. Jason Chang, Challenges in Development of Cycling Environment in Mixed Traffic Cities, Invited Keynote Speech, Velo-City Global 2012, Vancouver, Canada, June 25~28, 2012. S. K. Chang, Advanced travel Information with Smart Phone, invited speech in the 9th China Urban Transport Summit, Shenzhen, May 28-29, 2012. S. K. Jason Chang, From Web Taxi to Cloud Taxi: An Innovative Public Transport Service, Invited Lecture on 2012 ITS Symposium, Kuala Lumpur, Malaysia, April 14, 2012. S. K. Jason Chang, Taipei Smart Card Development, Invited Speech in the 6th Urban Mobility Conference, Delhi, India, December 4, 2011. S. K. Jason Chang, Green Transportation Policy: New Paradigm, Invited Keynote Speech in the 26th Annual Meeting of Chinese Institute of Transportation, December 1, 2011. S. K. Jason Chang, From Web-Taxi to Cloud Taxi: Innovation Public Transport Services, Invited Speech in the ITS Summit, Golden Coast, Australia, Sept 20-22, 2011. S. K. Jason Chang, “Missing Links of Green Transport and Social Space,” Invited presentation on the Cities for Mobility World Congress, Stuttgart, July 5, 2011. S. K. Jason Chang, “ITS/Telematics Development in Taiwan,” Invited Speech in the 5th Japan ITS Promotion Forum, Tokyo, Nov 24-25, 2010. S. K. Jason Chang, “Public Transport Policy and Experience in Taipei,” Invited Speech on the Taiwan Smart Green City Summit, Taipei, Taiwan, Oct 28, 2010. S. K. Jason Chang, “Social and Economic Benefits of Transit Metropolis”, Invited Speech in the International Seminar on Impact of Urban Rail on Urban Development, Oct 22, 2010. S. K. Jason Chang, “Smart Travel and Sustainable Mobility,” Invited Keynote Speech in the 10th Cross Strait Conference on ITS, Chongqing, China, Oct 20-21, 2010. S. K. Jason Chang, “Sharing Transportation: Why in Asia and Taiwan?” Invited Keynote Speech in the First World Sharing Transportation Forum, Kaohsiung, Taiwan, Sept 16-19, 2010. S. K. Jason Chang, “Public Transport Development and Seamless Transfer Planning,” Invited Keynote Speech in the International Forum on Sustainable Transportation Policies, Macau, July 2-3, 2010. S. K. Jason Chang, “Rationale of Bus Rapid Transit-oriented Development for Green Cities”, Invited Speech in the Forum on Smart Green Cities, Stanford University, May 10-12, 2010. S. K. Jason Chang, “e-Bus Development and Lessons Learnt,” Invited Speech on Executive Session Public Transport Policy, the 15th World Congress on Intelligent Transportation Systems, New York City, Nov 17, 2008. S. K. Jason Chang and Chang, H.W., “Taiwan Cycling: Industry and Common Usage,” Invited Presentation in the 2008 Better Air Quality Conference, Bangkok, Nov 10~13, 2008. S. K. Jason Chang, “Public Private Partnership for ITS Development,” Invited Keynote Speech, 2008 Asia Pacific Forum on ITS, Singapore, July 14~17, 2008. S. K. Jason Chang, “Status of Bicycling in Taiwan,” Invited Speech in the Cycling Forum, organized by Interface for Cycling Expert and India Institute of Technology, April 7~8, 2008.